Marks & Spencer Autograph Glittery Wool Black Jacket. Size UK 10. Marks & Spencer Autograph Glittery Wool Black Jacket. Size UK 10. Marks And Spencers. Marks on back. International size conversions. Stylish Autograph wool-mix cropped knitted jacket with half sleeve and pocket detail. Shawl collar, loose fit. Stunning M&S Black and grey herringbone jacket Size 12. Soft and warm - thick fabric. Fully lined jacket with 2 pockets on the front. Full zip fasten. Super quality. Sits on the lower waist area. MARKS & SPENCER . LOVELY GREEN WOOL MIX CROP JACKET . 60% ~ WOOL. DRY CLEAN ONLY. LENGTH - 21". UNDERARM TO CUFF ~ 17 ". 40% ~ VISCOSE. PIT TO PIT ~ 21". Great little wool jacket from Marks and Spencer. It fastens by way of a zip up the front and has two front pockets which are still sewn up. Beautiful Per Una black waffle weave blazer. Classy cream knit trim. Fully lined. Black waist length Lined coat with ruffle collar, long sleeves & button fastening. IN GOOD USED CONDITION. ONLY WEAR FROM USE. SEE PICS FOR HELP WITH CONDITION. AUTOGRAPH, MARKS & SPENCERS. 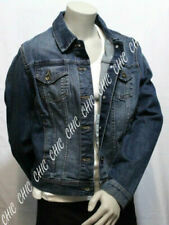 LADIES CHARCOAL COLOURED JACKET. MARKS & SPENCER. SINGLE BREASTED. LINED JACKET. RRP £39.50. 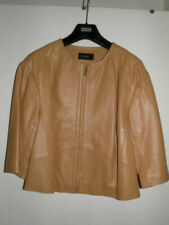 MARKS & SPENCER CROPPED JACKET. Wool Mix (30%). Machine Washable. Hook & Eye Fastening. Underarm to Cuff approx 8.5ins. Ladies stylish fully-lined wool mix jacket. 62% polyester, 23% acrylic, 10% polyamide, 5% wool. I would say an average/comfy UK 6 - stretch panels under arms / down sides for comfort fit. Machine wash.
Womens M&S Autograph Grey & Brown Mix Wool Jacket Size 14. TO CLEAR! M&S "matador style" jacket, bright PINK, size 12. Wool mix/Washable! See first and last pictures - taken in different lighting. The FIRST one is the best match. Also note the fabric is winter weight - quite thick - like a winter coat fabric. Says dry clean but I have washed it in the machine (in a protective bag) on a 30 wool wash.
Ladies black wool jacket. Size 18. Marks and Spencers. 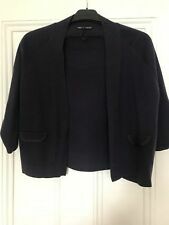 Ladies Marks and Spencers black smart collarless wool jacket. Size 18. 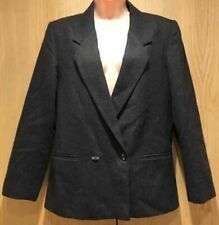 M&S LIMITED EDITION LUXURY TAILORED WOOL JACKET/ Size: Medium. M&S COLLECTION Women's Cowl Neck Flecked Cropped Jumper with Wool Size:10 NEW! Pretty gold and brown jacket with peter pan collar, 3/4 sleeves, 3 self-covered buttons, gathered shoulders. YOU ARE LOOKING AT A LOVELY WELL CUT DRESSY JACKET IN EXCELLENT CONDITION. EXACT FABRIC IS 50 ACRYLIC, 29 POLYESTER,17 WOOL, 2 COTTON, 2 POLYAMIDE. POLYESTER LINING. FULL LENGTH SLEEVES. TWO SMALL POCKETS TO FRONT. A Stunning Smart Wool Jacket Vintage St Michael Labelled Size 10 uk, eu 38 pit to Pit 36” shoulder to Shoulder straight 17” length 20” outside Sleeve 21” In Excellent Condition I am a Trusted Seller with 100% Positive Feedback, Buy with Confidence. 80% Wool ~ 20% Polyamide. 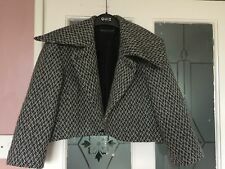 Hi, Lovely Classy Looking M&S Black & White Waist Length Wool Mix Weave Button Coat Size 12, Lovely Quality, Very Good Condition. Lovely Winter Coat. M&S Green one large velvet button Jacket. Worn twice. L ovely little jacket. Perfect for Spring 💐. Ladies waist length winter coat. colour - green mix as stated on label. Jacket length 20" approx. Two hand pockets. 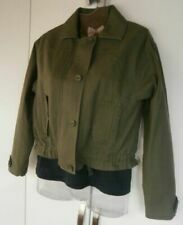 This is a lovely ladies wool mix jacket by Marks & Spencer-Limited Collection size 8. This is a nice charcoal colour with faux leather trim around the collar, pockets and front. 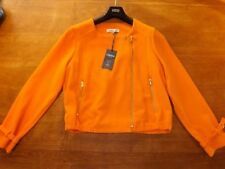 This jacket is fully lined and can be worn zipped up or half way up to give two different styles to the jacket. Marks and Spencer jacket size 10. Pure new wool. Lovely textured fabric jacket with big buttons at the front. Great with skirt or trousers. Marks And Spencer Ladies Red Black Tartan Check Wool Winter Coat UK 10. 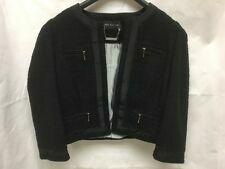 M&S Ladies black wool coat (cape style) uk Size 10. Double breasted with buttons. M&S Jacket Size 14 Blue Gold Red - Beloved. - Machine washable. UK Size 14. US Size 10. - Waist length. - Unique style. EU Size 42. - Fully lined. MARKS AND SPENCE BLACK WOOL WAISTCOAT. Soft wool, warm material. Excellent condition. Black half top lined. Nice style, tailored. M&S Indigo Collection Wool Blend Tartan Grey Navy Purple Check Mid length Autumn Coat Jacket. Navy blue & Grey with purple lines. 58.5cm / 23" arm length from shoulder seam to cuff. 79cm / 31"long from top of shoulder to lower hem. SOFT FAUX FUR COLLAR. ACRYLIC / WOOL BLEND.